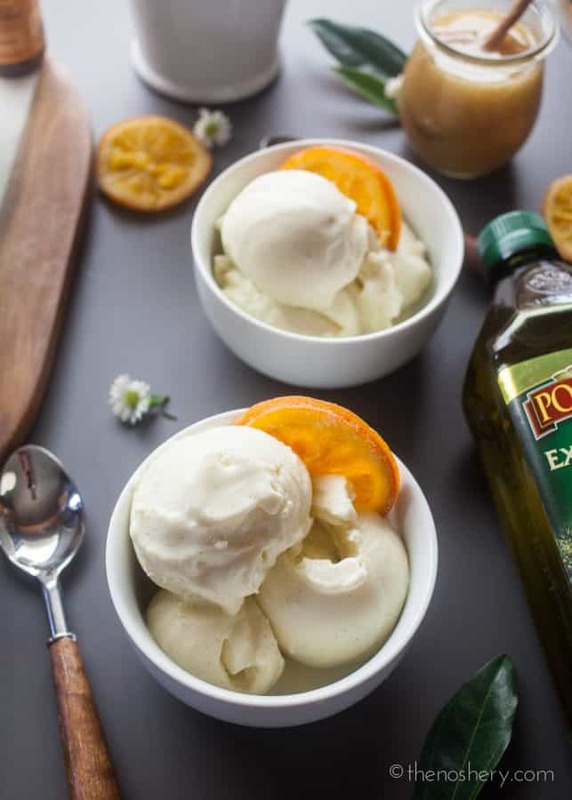 Orange Blossom & Olive Oil Gelato | This post was sponsored by Pompeian. All opinions expressed on my site are my own. It can be said that I am obsessed with oranges. Seriously obsessed. I’ve been known to eat 3 to 4 oranges at a time. Mainly because I love them but, also because I can never decide how to eat an orange. So, I eat three in one sitting and eat each one a different way. I know it makes me sound a little crazy, but we are all a little nutty in different ways. I think my obsession may have started when I lived in Florida. I have always enjoyed oranges but when I lived in central Florida I because obsessed. The other day while I ate a chilled fresh orange I remembered I use to work downwind from an orange orchard. At the start of summer, the fragrance of orange blossom would fill the air. That’s when it hit me, orange blossom gelato. And my brain kept churning like an ice cream maker. 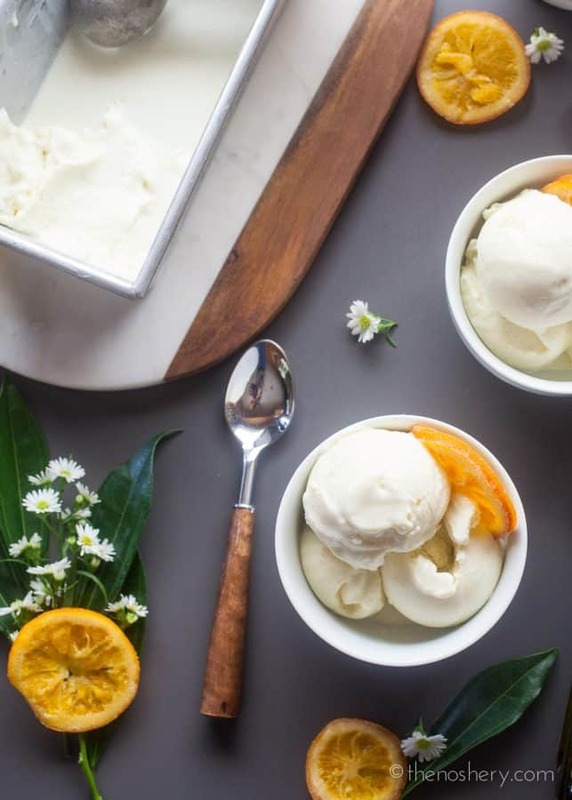 Citrus olive oil cakes are awesome and olive oil ice cream is also awesome so, foodie math would dictate that orange blossom and olive oil gelato would be amazing. 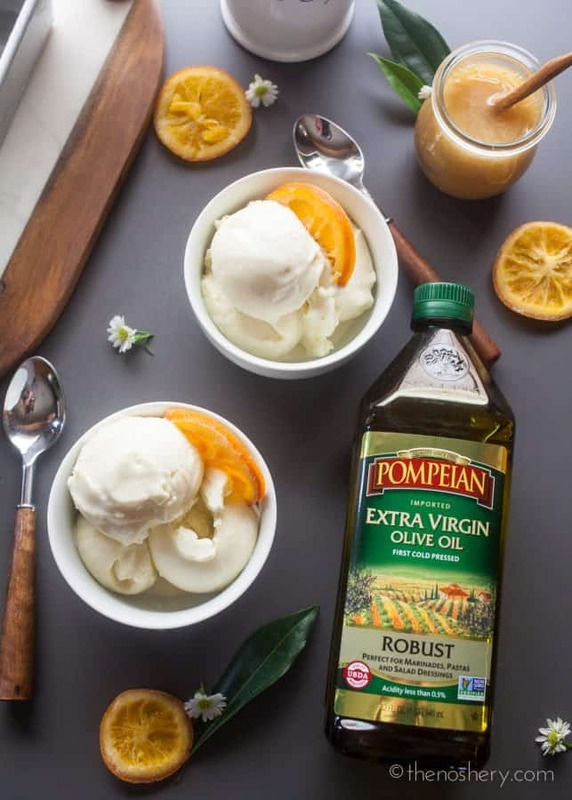 I thought that since Pompeian Robust Extra Virgin Olive Oil has a full-bodied flavor with fruity notes it would be ideal for making this ice cream. This extra virgin olive oil is extremely low in acidity, yet has a spicy and bitter character. A perfect pairing for orange blossom. I will tell you right now it was delicious. Perfectly creamy with a hint of citrus. The olive oil amplifies the creaminess while still maintaining a clean mouthfeel. 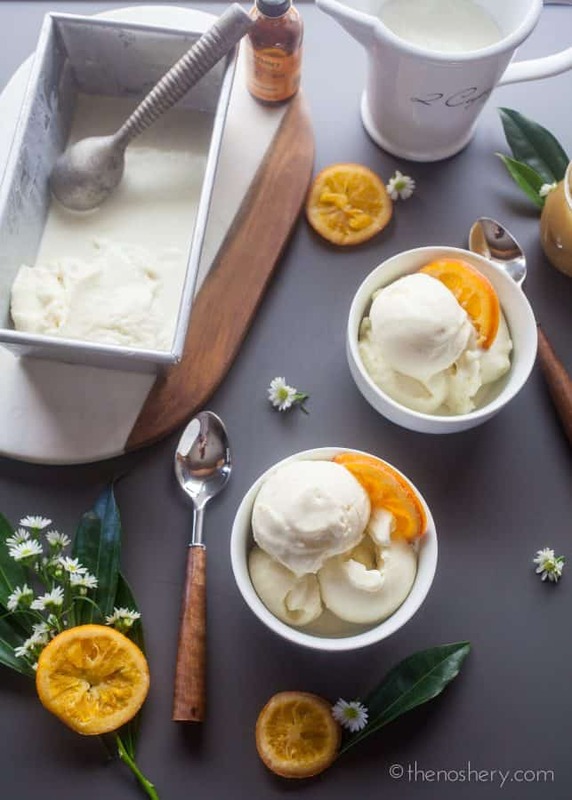 I decided to make a gelato instead of an ice cream because ice cream is fattier then gelato and I wanted to be sure this dessert remained delicate like an orange blossom. 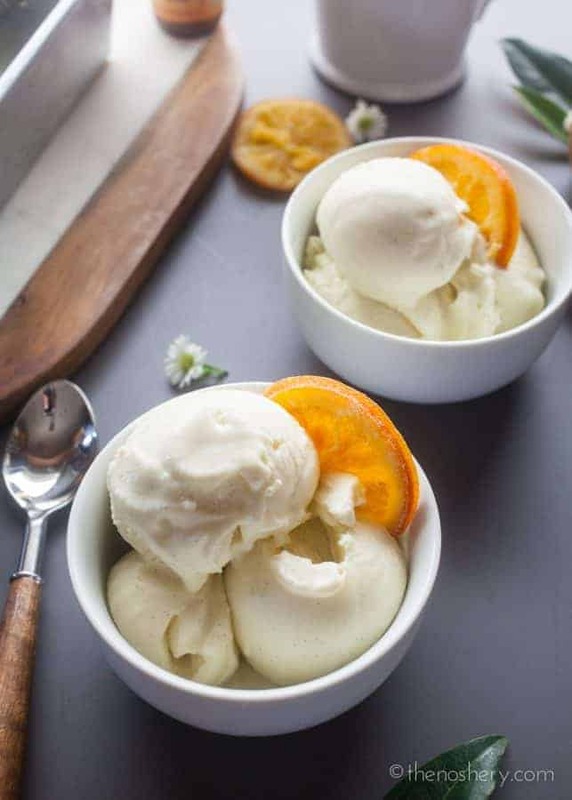 An ice cream recipe is custard based and is made with typically about five egg yolks, unlike gelato which will typically have one egg yolk. I based my recipe on a Sicilian gelato recipe that also uses cornstarch as a thickening agent. 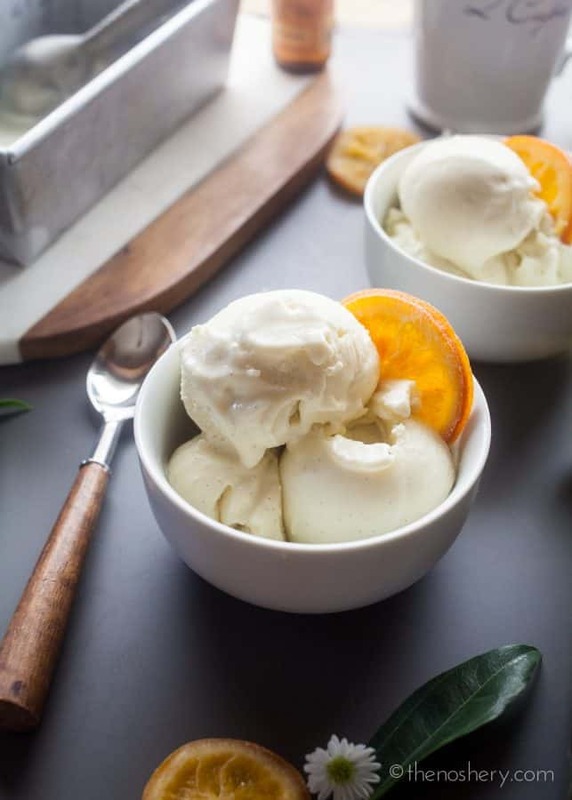 The result is a very light and creamy gelato that is perfect for summer. What are some of your floral inspired dishes? But don’t just tell me about them. Show me and Pompeian how you are experimenting with the latest food trends on Instagram. To share your latest on-trend creations using Pompeian, tag your photos with #TrendingintheKitchen. If you looking for inspiration or for tips on how to trend in the kitchen, visit Instagram.com/Pompeian or check out my recipe collection. Are you as crazy about orange as I am? Then you may want to try my Orange Salsa, Citrus Herb Glazed Ribs, or Better Than Take-Out Orange Chicken. Creamy and light Sicilian gelato made with a hint of orange blossom and extra virgin olive oil. 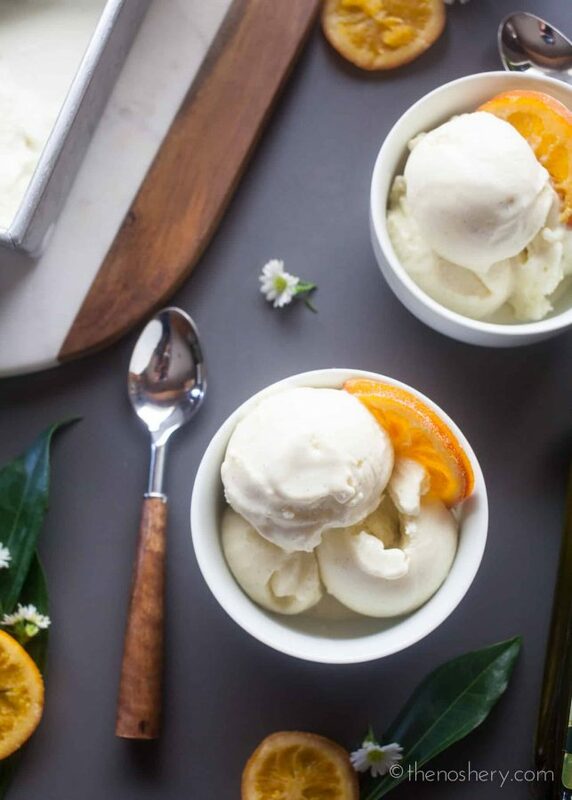 The result is a perfectly creamy gelato with a hint of citrus. The olive oil amplifies the creaminess while still maintaining a clean mouthfeel. In a heavy-bottom medium saucepan combine 1 1/4 cups of the milk, heavy cream, olive oil, and vanilla bean heat over medium heat until bubbles appear around the edge of the saucepan and mixture and is about to boil. In a small bowl combine remaining 1 cup milk, sugar, honey, orange blossom water, and cornstarch into a small bowl, whisk until well combined. Remove saucepan from heat and stir in cornstarch mixture. 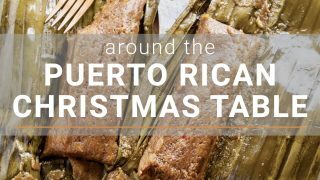 Return saucepan to heat and cook, stirring frequently, until sugar dissolves and mixture thicken slightly about 8-10 minutes. Remove saucepan from heat. Add egg yolk into a medium bowl and whisk until slightly thickened. Slowly add 1 cup of the hot milk mixture to the yolk, whisking constantly. Slowly add mixture back into the hot milk mixture in the saucepan, whisking until well combined. 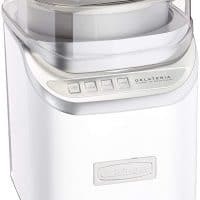 Process in an ice cream maker according to manufacturer's directions. Transfer to a storage container with lid and place in the freezer for 1 hour.